It's a funny old business returning home from a holiday, don't you think? The two things I look forward to most about coming home are being reunited with Bertie spaniel (he stays at my MIL's) and sleeping in my own bed. Without fail, I always get an overwhelming desire to simplify things. I think it's after living out of a suitcase for almost two weeks. I want to declutter and get back to basics. Ideally, I should like us each to own only two outfits (one to wear while one is in the wash). I want no more than one knife, fork, spoon, plate etc., per person. I want a one in-one out way of life. I want scrubbed-clean white-washed walls and to shop for the day's food each morning. Too much sun to the head I suspect. I adore cooking but, oh my, it's so good to have a break - not just from the actual cooking but the meal-planning and shopping too. D always takes over the food reins completely when we go on holiday. Since being home though, I've thoroughly enjoyed getting back into the swing again and yes, you could say, my culinary batteries have been well and truly recharged. 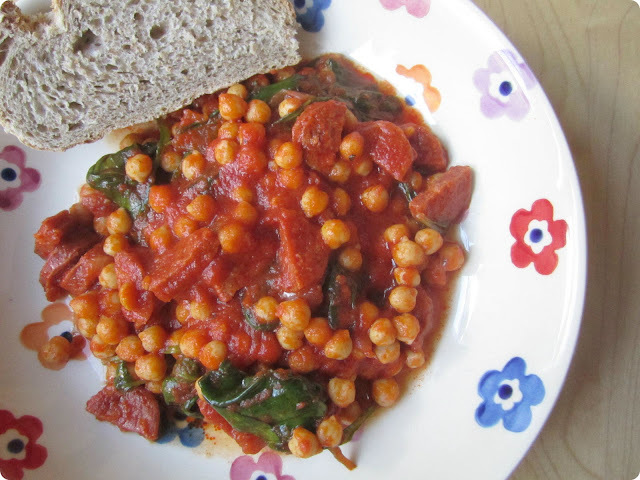 Everybody's favourite chorizo and chickpea stew. Pesto pasta (this time with watercress and basil) and a scattering of toasted burnt pine nuts. 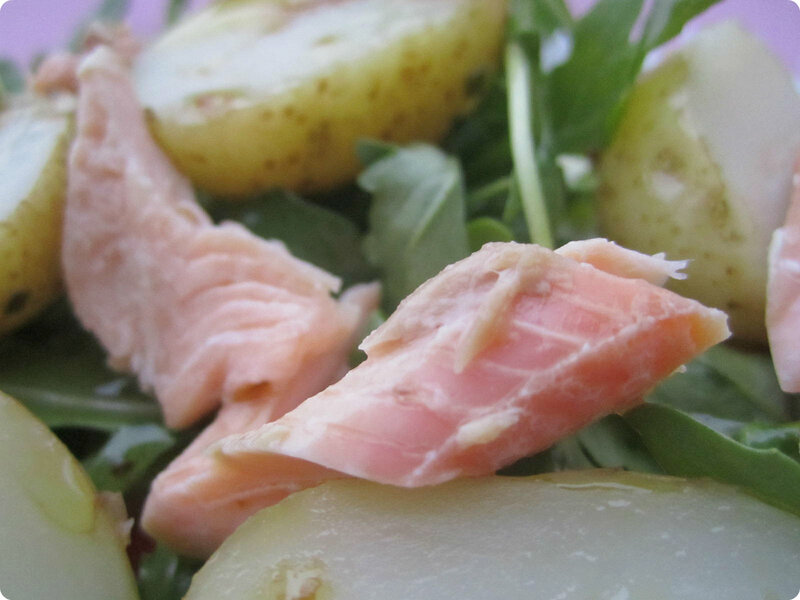 A warm salad of trout, new potatoes and watercress. Ooh, I was tickled pink too to find that Waitrose sells my beloved samphire (albeit for about four times the French market price). I've been pinning recipe ideas like a mad thing and it would seem I'm not the only one who's fallen under it's salty spell! The holiday blues struck one night earlier in the week. D was late home from work and both Blondies were at respective friends houses and I suddenly felt quite low. I missed them all terribly and wanted us to be back in France, together. It did pass. It's been a week of very little else to report really. Just long, lazy days of bitting and bobbing. D and I are meeting some friends for a steak and chip supper at the pub tonight. I'm off to paint my toenails and earmark a roomy top to wear!!! PS. Thank you so much for all your kind comments. I don't tell you enough but I do delight in every single one. My blog always strikes me as a lot more scrappy than most so it thrills me that you're there, reading. I'm often asked crochet-related questions which I hope to tackle in a 'loose ends' type post very soon. Yum yum yum! I've already eaten a meal, cake and a bowl of sweets (what a pig!!) but you post still managed to make me think of food! That chickpea and chorizo stew looks and sounds great. I've made it my aim this week to pull out some recipe books and cook properly a couple of times this week. It's so easy to be lazy living alone! You've been cooking up some really delicious looking meals. 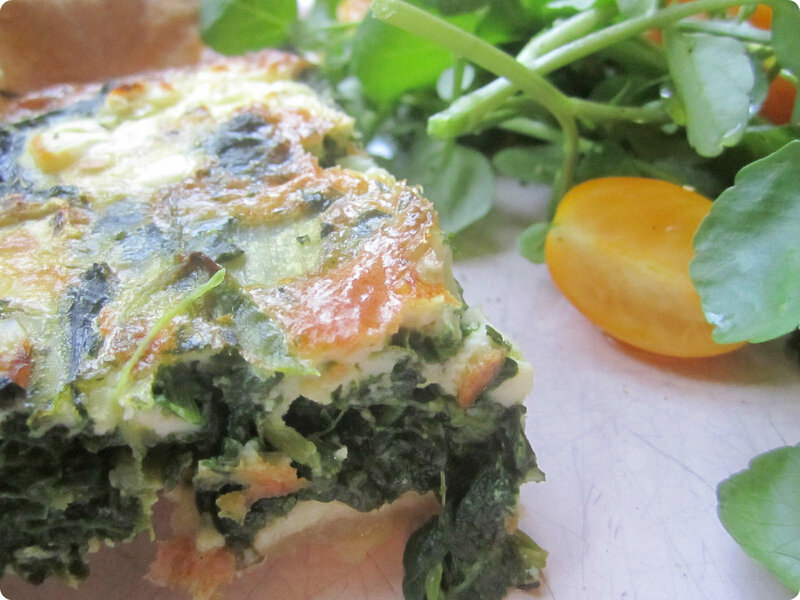 I just ate lunch and now I'm hungry again...for your spinach pie! I went food shopping first thing this morning, but unfortunately this time around I didn't get any spinach. :( I may just zip back to the market for some and some Monterey Jack cheese too. See how inspiring you are?! There's no place like home, sweetie pie. Have a really fun weekend! That a;; looks so yummy. It's always lovely to get an injection of enthusiasm about cooking and you menu this week looks fabulous. I feel similar to you when I get back home from a holiday, I have to admit. Te meals you have been making all look fabulous. Mmmmm, your gorgeous photos are making me feel very hungry! I hate to admit it, but I've never actually tried samphire, and it grows wild on the salt marsh opposite my house ... need to hone my foraging skills beyond blackberrying! Umm, your menu sounds gorgeous. I'm afraid cooking is something I do from obligation rather than pleasure, I wish someone else would jump in and take over for me! But I love your ideas, it's always lovely to get some new inspiration. I agree though that the simple holiday pleasures do make you ask questions about how you live your life. Things always seem simpler on holiday don't they? That all looks quite delicious! I know exactly what you mean about de-cluttering - I'm always amazed at how much washing there is in this house. I read an article recently about a woman who totally de-cluttered to the point of only owning 4 pairs of shoes, 1 pair of jeans etc etc - I've been recycling like mad since but still overwhelmed by 'stuff'! 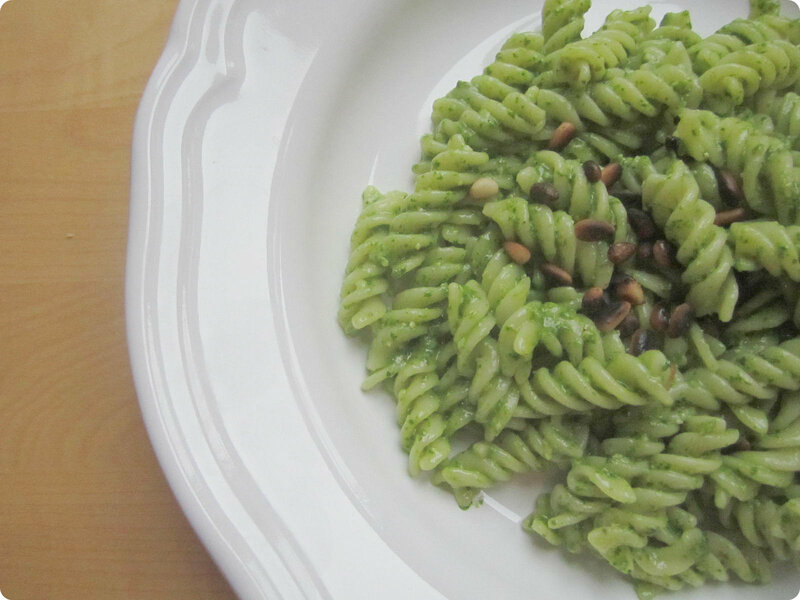 Your meals look lovely, Pasta and pine nuts is a favourite here too :) I want to try that quiche though and your chickpea/chorizo stew - yumm. Glad you had a lovely hol - looks perfect. Ooh, everything looks delicious Heather! I'm definitely going to follow the link for the spinach quiche and I'd love to try the chorizo and chickpea stew. Your holiday pics are beautiful...It's always good to be home but it does take a bit of adjustment when you return back to earth, doesn't it? You have always been a fab cook hunni, everything looks scrumptious!! I would really love your chorizo and chickpea stew...yummy! Looks like you had a great holiday...I know what you mean about returning from a great time away, the thing I always dread is all the washing and ironing to be done!! Dear Heather (41), I dashed straight over to meet your purple tights and my immediate conclusions are that you cook my sort of food and that I too must declutter, vehemently and instantly, while simultaneously whitewashing everything. Please let me know how you get on, and remind me when my impetus fades. The food looks absolutely delicious - you must be a great cook. What I miss most about coming home from a holiday is actually a simple home cooked meal.